The South Street Seaport a historic section of Lower Manhattan, adjacent to the Financial District. 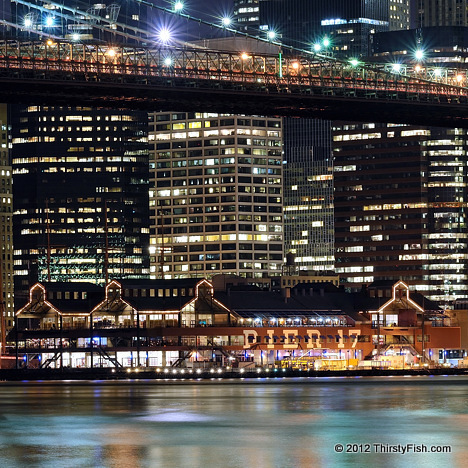 Ever since the 1983 conversion of Pier 17 into a shopping pavilion, the Seaport attracts many shoppers and tourists. A section of Brooklyn Bridge can also be seen in the upper part of this photograph taken from Brooklyn. Compare this image with the earlier Japanese Garden photograph. The comparison is a bit unfair. The garden image was taken with a wide angle lens (24mm) which stressed the sense of space, while this image, taken with a long lens (150mm), compressed the scene and exaggerated the "boxed-in" feeling. While taking this photograph, I did not feel boxed-in because the human eye has a much larger field of view than a long lens. Exaggerating perspective, whether wide or telephoto, alters the mood of a photograph. Perspective distortion is caused by the distance to objects; closer objects seem larger than distant objects. If I had shot this same scene with a 24mm lens, and cropped the image to match the 150mm one, the perspective would be the same. The focal length that best duplicates the perspective of the human eye, the relative sizes of objects, is approximately 45mm on a full frame camera. On this format, lenses between 40 and 58mm are considered to be normal lenses.